What’s the best way to zero your rifle..? And one of the popular answers is “an inch high at 100 yards”. I’ve seen many responses to this along the lines of “that sounds complicated” and “why bother? I just zero dead on at 100”. The fact is, an inch high at 100 is a simple way of giving you greater range at which you can shoot without having to worry about hold-over – meaning you can “point and shoot” out to greater range. But you can go better than that… and that’s setting up your rifle to adhere to the concept of MPBR – Maximum Point Blank Range. By definition, Maximum Point Blank Range is the range over which you can shoot where your bullet doesn’t go above or below your horizontal crosshair by more than a determined amount. What actually happens to a bullet when it leaves the barrel of your rifle..? 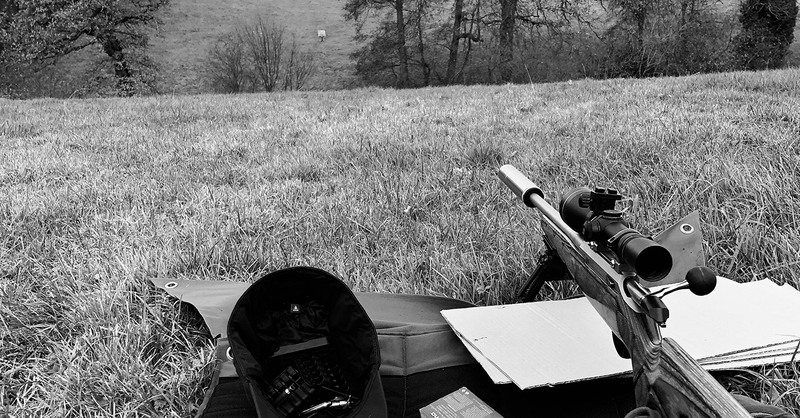 Rifle set up – the relationship between your scope and your barrel. Why MPBR is the most effective method for zeroing your rifle. What happens when a bullet leaves the barrel of your rifle..? If you were to drop a bullet from the height of your chamber at same time as firing a round from your rifle, the two bullets would hit the ground at the same time – one by your feet, the other several hundred yards down range. So the key message here is bullets don’t fly – they just fall. Some are more stable than others, some are more aerodynamic than others – but they all fall the moment they leave your barrel. So… imagine you’re bench rested and the line of sight of your scope is 100% parallel with the ground. Based on what we’ve established, if your barrel was parallel to your scope – and the bullet is dropping the second it leaves your barrel, then the bullet will never cross the line of sight – so your point of impact will never be at the intersection of your crosshairs. In order to get your bullet to cross the line of sight of your scope, then the barrel needs to be angled up towards your scope. So you are actually shooting upwards towards the line of sight. The following example is a 40gn VMax with a muzzle velocity of 3500fps. Zeroing at 100 yards results in the bullet trajectory never going higher than the line of sight of your scope and at 200 yards, the bullet will be 2.28 inches low. This is fine if all you ever do is shoot things out to 160-180 yards. Anything past that and you’re going to have to compensate with hold over to allow for bullet drop. In this example, the bullets trajectory crosses the line of sight at 47.5 yards, is 1” high at 100 yards, and at 200 yards, its just quarter of an inch below your cross hairs. In fact, from 20 yards to 220 yards, the bullet is never more than 1 inch above or below the cross hairs. Clearly that’s a major advantage as for anything you’re shooting within that range, you don’t need to hold over or under to for your bullet to strike within a 2” vertical spread. By definition, Point Blank Range is the range over which you can shoot where your bullet doesn’t go above or below your horizontal crosshair by more than a determined amount. One way to explain this it is to imagine you are shooting into a pipe. The diameter of the pipe is the size of the kill zone of your target… The MPBR is the furthest distance that you can shoot so that the bullet touches neither the top nor the bottom of the pipe. For the sake of this post, lets decide that the kill zone for a fox is 3” – we therefore want to work out the best zero so that our bullets POI is never more, or less than 1.5” from the horizontal crosshair. The green tinted band represents the Kill Zone of 3”. Using the PBR and MPBR terminology with this example, your Point Blank Range is 5-241 yards – and your Maximum Point Blank Range is 241 Yards. Hopefully that all made sense – and you can see the advantage of using MPBR to determine the best zero to get the most from your rifle. In short, understanding and utilising the concept of MPBR allows you to zero your rifle to give you the maximum possible range over which you can “point and shoot” without having to worry about hold over / under. Shooters Calculator – another great app for working out MPBR. Thanks Simon – it’s a bit of challenge getting your head around the concept but when it clicks – it makes a lot of sense! Awesome example Rob… makes every shooter life a lot simpler when out lamping when ranges can’t be measured accurately.. Excellent article, for the night time fox shooter especially, this information is essential. I use this approach when out on openg hill ground for deer, but I don’t zero an inch high, I zero at bang on 100 and dial it to my mpbr setting, allowing me to point and shoot whilst being able to alter for a more precise shot at longer range of needed.